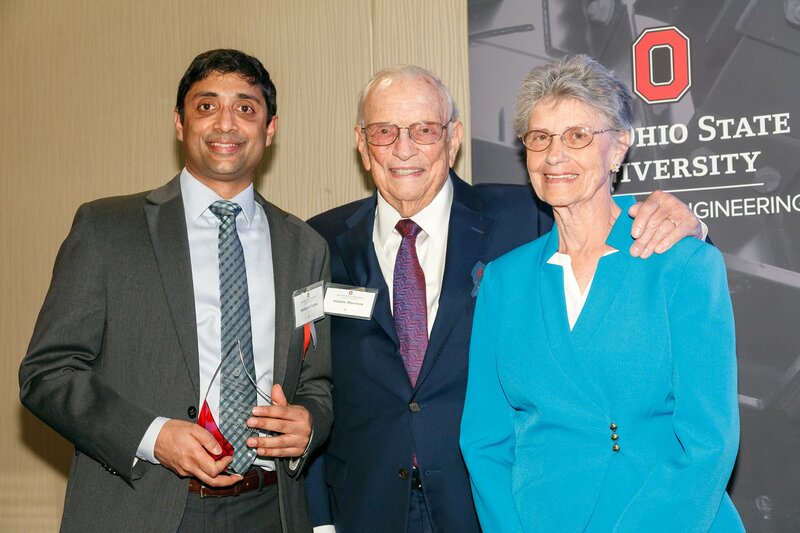 For the first time, two faculty in the College of Engineering at The Ohio State University received the Harrison Faculty Award for Excellence in Engineering Education. The winners, Associate Professor Siddharth Rajan and Professor Roberto Myers, are both faculty in electrical and computer engineering (ECE) and material science engineering (MSE) within the Institute for Materials Research at Ohio State. Established in 1982, this is the first time the annual Harrison Award was presented to two recipients. Winners are faculty members in engineering or architecture, making a positive impact on society, and showing excellence in aspects of teaching, fundamental or applied research. Research by Myers and Rajan is becoming increasingly acknowledged for their focus on finding next-generation energy sources at the nanoscale. Rajan is principal investigator for the Rajan Group at the Electron Device Laboratory at Ohio State. He works with students in the creation of new devices with improved performance and functionality. The team produces several publications a year, often winning awards for research into tunnel-injected UV’s LEDs, delta-doped transistors and more. Ph.D. candidate Yuewei Zhang said, as a mentor Rajan is open-minded and always interested in discussing and discovering new methods within ECE. Aside from making strides in semiconductor technology, Rajan recently earned funding from the Department of Defense (DoD) to accelerate important research and training of graduate students as part of a Multidisciplinary University Research Initiative (MURI) award. Rajan earned his Ph.D. in 2006 from the University of California – Santa Barbara. 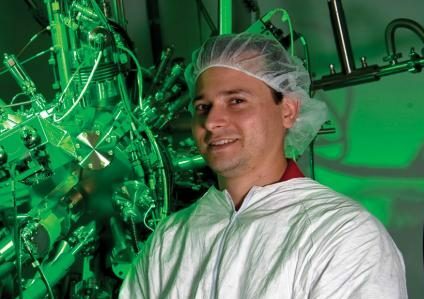 His areas of interest include nanoscale semiconductor devices, molecular beam epitaxy, and III-nitride semiconductors. Myers created and leads The Myers Group at Ohio State, which focuses on molecular beam epitaxy of wide band gap semiconductors, particularly polarization-engineered nanowire LEDs, as well as materials for thermal spintronics. The professor is the principal investigator of a five-year $6 million Department of Defense funded MURI aimed at understanding the mechanisms behind spin caloritronic effects, or electrical currents in which heat flow causes a flow of spins. His group also conducts research through the Center for Emergent Materials focused on engineering non-linear spin fluxes in magnetic materials. Nomination letters highlight how his work in collaboration with Machanican and Aerspace Engineering Professor Joseph Heremans helped explore and demonstrate the spin Seebeck effect, which converts temperature differences between different materials and converts this into power. It’s considered the only new thermoelectric effect identified by science since 1887 and the breakthrough made the cover of the journal Nature. Myers also earned his Ph.D. in 2006 from the University of California – Santa Barbara. Established in 1983 with a gift from Doris and Stanley Harrison (’58, electrical engineering), this award honors an early to mid-career faculty member’s excellence in teaching and qualitative aspects of teaching, exceptional research, or contributions to engineering or architecture concepts. Learn more about the legacy of the Harrison family.